Different editions, options and “additional capabilities” are available when licensing SAP HANA. In this blog, I will provide an overview and list resources where you can find more information. Both enterprise editions bundled SAP HANA with other SAP products to include the technologies needed to replicate data from the source systems(s) to the In-Memory database. Over the years, the HANA portfolio has become a bit more complex and we now have a wide range of editions and options. For application development, no license restrictions exist for features. Dynamic Tiering (multitier storage) and active/active read-enabled replication (high availability); both are options. Most features for advanced analytical processing for HANA 2.0 are bundled in the platform edition, with the exception of Spatial. In HANA 1.0, Spatial, Search and Test analytics are options. Streaming is an option in HANA 2.0. Data integration and quality are a smörgåsbord of editions and options; read on. Add-On products (delivery units) – need to be imported/installed into a HANA system. Additional products that can work with HANA but also stand-alone, often licensed separately. For options and editions, no distinction is made between these categories. That is, we find core capabilities listed as options and add-on products listed as editions, or vice versa. For example, with SAP HANA 2.0, the enterprise edition includes the data replication products: SLT and Smart Data Integration (using Data Services technology). However, real-time data replication is now also an option, and then includes SLT, Replication Server, and Remote Data Synch (SQLAnywhere). Spatial is an option for SAP HANA 1.0 SPS 12 but in SAP HANA 2.0 it is an edition, bundled together with Data Warehouse Foundation (DWF), also an SAP HANA 1.0 option. See also SAP HANA Options (Earlier Releases) on the SAP Help Portal. Text Search, Text Analysis and Mining in SAP HANA 1.0 SPS 12 together comprise the Advanced Data Processing option. In SAP HANA 2.0, they are licensed with the enterprise edition. Technically, Text is part of any HANA system, you cannot take it out. As the SAP HANA server does not perform any license check on the technology used (only on the amount of memory), you might expect that built-in technology – features and functions that come with the server and without an on/off switch – would be listed as option, and add-on products as an edition, but is not the case. All four categories are all mixed together. So let’s just accept that the labelling is a commercial / legal effort and take a look at our options (and editions). The SAP HANA, express edition for developers and the SAP HANA, Edge edition, advanced version for SMEs are not listed in this HANA scope description. Express has its own Feature Scope Description. For Edge, see the Solution Brief. So let’s unbox the editions. The base edition contains all the features and functions of database, integration and application services. For the whole list, see the scope description. This means that you do not need a separate license for scaling out (distributed systems / clusters), for multi-tenancy, partitioning, federation, encryption, etc. The only exception is the Active/Active Read-Enabled system replication option (see below, under Options). The SAP HANA 2.0, base edition also includes the SAP HANA Accelerator for SAP ASE. For SAP HANA 1.0 SPS 12 it is an option. Enables to run reports in SAP HANA using the data in SAP ASE for real-time analytics, either by replicating the data from SAP ASE to SAP HANA or by creating virtual tables in SAP HANA which access SAP ASE data. For more information about Spatial, see the playlist on YouTube: http://bit.ly/HANASpatial. For more information about DWF, see the playlist on YouTube: http://bit.ly/HANADWF. Includes four new videos about native DSO for SAP HANA 2.0. Text Analysis was introduced with SPS 05 (2013) but the technology goes back to Xerox PARC and Inxight, acquired by Business Objects. SLT has been included in the enterprise edition since day 1. This replication technology from SAP is trigger-based and operates on the ABAP level, logical replication, in other words. Used only to replicate data from a SAP system (Business Suite / Business Warehouse) to SAP HANA. For more information, see the SLT Community. SAP Enterprise Architecture Designer was introduced with SAP HANA 2.0 and runs as an SAP HANA XS application. It it based on SAP PowerDesigner technology. For more information about SAP EA Designer, see SAP Note 2390650 – SAP Enterprise Architecture Designer v1.0, edition for SAP HANA Technical Release Information and the SAP EA Designer Guide on the SAP Help Portal. For the SAP HANA options, we have two sources, the mentioned Feature Scope Description for SAP HANA and the SAP HANA Options and Additional Capabilities page on the SAP Help Portal. Unfortunately, both sources do not correspond exactly. For example, the Help Portal lists the Data Warehouse Foundation as an option, as was the case with HANA 1.0, whereas according to the scope description with HANA 2.0 it is no longer an option but now is part of the Spatial edition. Below, the options from the feature scope description. Active/Active read-enabled system replication is new with SAP HANA 2.0. This feature enables read access to a secondary SAP HANA system, typically on another location. For more information, see the tutorial video SAP HANA Academy – SAP HANA 2.0: What’s New with Administration III [2.0 SPS 00], where Active/Active read-enabled system replication is addressed. Dynamic tiering adds disk-based extended storage to the SAP HANA database. Often labelled as a native big data solution as it supports large or huge data sets, for scenarios where storing all data in memory would neither not be desired or required. From an architecture point of view, this combines both smart data access technology, where tables are presented virtually in the SAP HANA database with the columnar storage of SAP IQ. For more information, see the tutorial video SAP HANA Academy – SAP HANA Dynamic Tiering 2.0: What’s New?. Smart data streaming provides streaming analytic capabilities for the SAP HANA platform. Like Dynamic Tiering, leverages former Sybase technology: Event Stream Processor (ESP). For more information, see the tutorial video SAP HANA Academy – SAP HANA Smart Data Streaming 2.0: What’s New?. Full playlist: Smart Data Streaming. 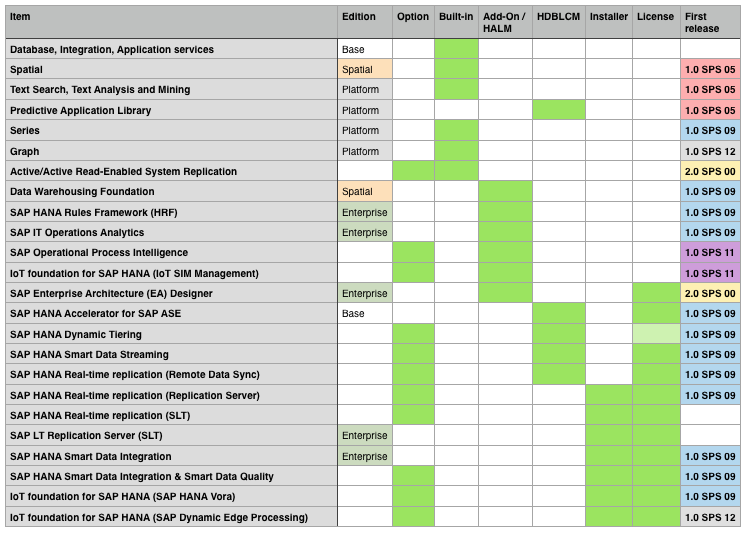 SDI and its sibling SDQ have been addressed above, under the SAP HANA, enterprise edition. SAP Replication Server can be used to replicate, at the log level, data from an SAP ASE source database to an SAP HANA target. SAP HANA remote data sync enables the synchronization of SAP SQL Anywhere remote databases with a consolidated database, based on a session-based synchronization technology. SAP Operational Process Intelligence enables process participants and lines of business managers to drive the execution of their operational business processes through process visibility and performance management by defining their goals, milestones, and KPI’s and measuring the process success along easy-to-understand process phases, simulations, and predictions. For more information, see the SAP TechEd Online 2016 recording or the product page on sap.com. Dynamic Tiering, Smart Data Streaming and Remote Data Synch have been addressed above. For SAP Dynamic Edge Processing, see the product page on sap.com. SAP HANA Academy – SAP HANA Dynamic Tiering 2.0: What’s New? 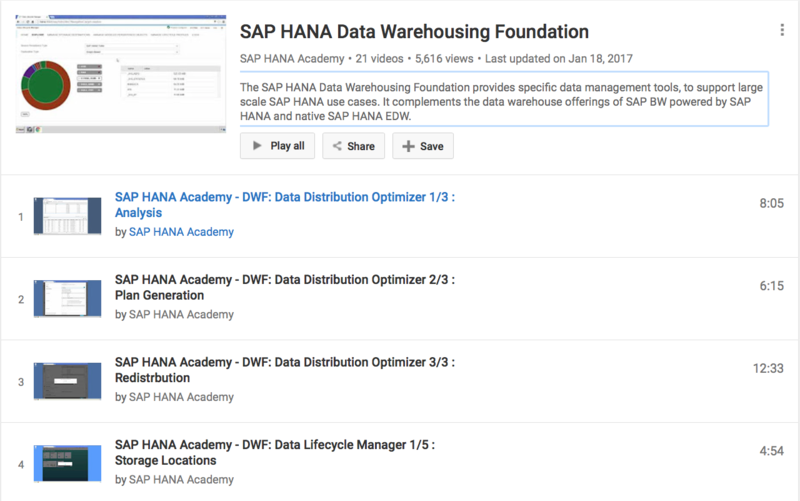 SAP HANA Academy – SAP HANA Smart Data Streaming 2.0: What’s New? is there already a HANA 2.0 Revision which is recommended by SAP for running critical Production SAP systems ? Is HANA 2.0 going to have a stable Support Pack version which has a 3 years life, eg, like SPS12 in HANA 1.0 ? We are thinking to go to HANA 2.0 in the summer. Starting with SAP HANA 2.0 SPS00, SAP will not explicitly declare a DSP anymore. thank you. When I saw HANA 1.0 SPS12 being supported from May 2016 to May 2019, I saw that as a step in the roadmap of HANA’s journey towards maturity, I mean, we are all used to Oracle 10, or Oracle 11, or Oracle 12 being supported for a number of years and receiving Interim Patches on a periodic basis in between Version releases. And this has been a challenge in the HANA Administration and Operation, keeping up with the frequency and duration of support of HANA Support Packs. When I say support I mean a support pack version having a bug fix life of for example only 9 to 12 months. With HANA 1.0 SPS12, we got a bugfix life of 3 years which is more in line with what we are used to with Oracle, and I interpreted that as being intentional from SAP’s side to give Customers some breathing space regarding keeping up with the latest HANA Support Packs, but nevertheless in a well run Operation deploying Revisions on an annual frequency for the same Support Pack. Now when I see that HANA 2.0 is going back to the previous model of releasing Support Pack versions every 6 months, I fear we are back to the situation where if we stay with a Support Pack version for more than 9 months, we can no longer be sure of getting bug fixes for that SP version and probably if we get a bug once the SP version is greater than 9 months old our only option will be a higher SP version deployment. And this suggests that the 3 years support for the HANA 1.0 SP12 was not actually to give Customers breathing space regarding major Version upgrades (SP Upgrades) of HANA 1.0, but infact, to give Customers 3 years to get off HANA 1.0 and onto HANA 2.0 ? Question, in HANA 2.0, what will be the duration lifetime of bug fix support for each Support Package version, 6 months, 9 months ? This is very important for our Operation and I am sure others, because this dictates the frequency that we have to plan to apply Support Pack upgrades on the HANA Systems Landscapes, because if we plan to Support Pack Upgrade HANA 2.0 once per year, then we have the chance of for a period of time running an SP stack version which is no longer receiving bug fixes. With HANA 2.0 we will deliver new features twice a year in the form of Support Packages Stacks. We will provide Maintenance Revisions between RTC of the following and the over-next SPS. These Maintenance Revisions contain only major bug fixes, identified to be relevant in particular for production environments. another question, on the HANA 2.0 Upgrade and relevant to this blog and conversation and anybody considering upgrading to HANA 2.0. If you are unable to answer this question in this forum that will be understood and respected and I’ll use the regular SAP Support/Max Attention Channels to get the answer. If a SAP Customer upgrades to HANA 2.0 SPSxy, from HANA 1.0 SPSxy, are Technical Regresson Tests enough or does SAP recommend the Customer to do Business Functional Tests of the affected SAP Applications ? Basically, is HANA 2.0 bringing new functionality which is not in HANA 1.0 and which would dictate the Customer to do Business Tests as well as Technical Tests following the HANA 2.0 Upgrade ? No problem if that cannot be answered here. In the Revision Strategy v22 ppt, page 11, it’s says “Upgrade from any SAP HANA system running on SPS10 or newer is possible”, and we knew that HANA 2.0 SPS00 already had RTC last November. Because I don’t see any “restrictions”, I assume that we can upgrade SoH to HANA 2.0 as well? Page 14 also “suggest” the same direction, as it says “• If customers consider doing regression tests, then they might consider technical regression tests only, Business Acceptance tests are normally not required if no new features are used on application level”….so from here my interpretation is also the same, so if I can have SoH upgraded to HANA 2.0. Please do confirm/clarify if this is a correct interpretation. I would like to know when we will have SAP HANA 2.0 in the cloud ?. I can see that SAP HANA Express Edition 2.0 is in HCP but not SAP HANA. On SAP Hana Cloud trial as well the version is still 1.0. Any estimate about that ?. Thank you . Wonderful blog . Any chance you can provide answer to my question? shouldnt be there a green box in License column for Active / Active scenario, the same like for DT option? All editions and options actually require a license. This column indicates that you need to install a separate license (typically because it is a separate product / technology). I would therefore expect that Active/active replication requires a separate license, isnt it so? When you install SAP HANA server, a temporary license is activated and you will need to get a permanent license, which includes, for example, the amount of memory licensed but it does not store any information about features, capabilities, editions or options. In other words, the HANA server does not know if you have a license for active/active read-enabled replication. The products listed in the green “license” columns require their own physical license. You need to do something: get an additional license file or enter a license code in the setup program, etc. in the presentation a few days ago it was mentioned that 5 licences are included. Does that mean even with cheapest HANA solution (HANA Base) 5 units (named users or concurrent users??) are included or do I need at least HANA Enterprise. As you can see from the packaging matrix for HANA 2.0 above, SAP EA Designer is included as part of HANA 2.0 Enterprise Edition. Specifically, the HANA 2.0 Enterprise Edition includes 5 (Concurrent Session / CS) licenses. Additional license may be purchased and added to this HANA edition for EA Designer and/or may be purchased to run on the other HANA 2.0 editions available as an added application. I’ve read your article and found it extremely helpful and informative. which is the highest DB Volume that we can offer in HANA (i.e. 100 TB) à do we have customers who already have done such large Hana projects? What should we do if a customer wants to go from HANA runtime to Full use? Application development is part of every edition of SAP HANA and no license restrictions exist for its features. This covers both XS classic and advanced native development (XSJS, Node.js, Java) or any development accessing the database through OData, ODBC/JDBC. Concerning the highest database volume, I would have to reach out to my colleagues for some ballpark figures (will update). Good question but best to be discussed with your SAP account manager. With SAP HANA 2.0 SP02 there was an edition of SAP HANA called “base edition” It seems that this edition is no longer available and was replaced with the “standard edition” in SAP HANA 2.0 SP03. Is this a correction assumption? SAP unfortunately does a horrible job providing a roadmap through the constant product munging and it is not possible to access the Feature Scope Description for any HANA version earlier than 2.0 SP03. Another question, if I am running HANA 2.0 in the cloud currently, I must be using the “standard edition”?